Over the next ten days, we at IDA will be introducing-and in some cases, re-introducing-our community to the filmmakers whose work has been nominated for an Academy Award for either Best Documentary Feature or Best Documentary Short Subject. As we did in conjunction with the DocuWeekTM Theatrical Documentary Showcase that we presented last summer, we have asked the filmmakers to share the stories behind their films-the inspirations, the challenges and obstacles, the goals and objectives, the reactions to their films so far, and the impact of an Academy Award nomination. So, to kick off this series of conversations, here is Adam Pertofsky, director of The Witness: From the Balcony of Room 306, which is nominated in the Documentary Short Subject category. 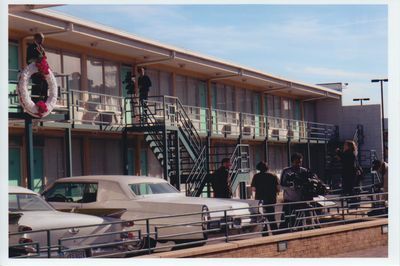 Synopsis: On April 4, 1968, the Revered Samuel "Billy" Kyles stood beside Dr. Martin Luther King Jr. on the balcony of the Lorraine Motel in Memphis, Tennessee, and bore witness to his brutal assassination. Through Rev. Kyles' recollections of those fateful moments and the days leading up to them, The Witness: From the Balcony of Room 306 helps us remember why Dr. King made that fateful trip to Memphis, and takes us inside the last hours of his life. With moving testimony from civil rights luminaries such as Maxine Smith and Dr. Benjamin Hooks as well as other contemporaries of Dr. King, The Witness is a poignant retelling of a crucial turning point in the civil rights movement and a vibrant reminder of Dr. King's impact on the movement and our nation. IDA: How did you get started in documentary filmmaking? in editing, but as an editor, I've always enjoyed documentaries because you find their voice in the editing process. IDA: What inspired you to make The Witness: From the Balcony of Room 306? I've always had a passion for Dr. King's teachings and the civil rights movement, so when Margaret Hyde, the producer, approached me about doing this film, I was ecstatic. I felt it was a very important piece of history that needed to be documented. IDA: What were some of the challenges and obstacles in making this film, and how did you overcome them? AP: The biggest challenge we faced was time. We began filming in February 2008, and the film had to be completed by April 1, 2008, for the 40th memorial of Dr. King's death. That did not give me a lot of time to shoot and edit the film. All in all, we had seven weeks. The good thing was that we knew the core of the film was Rev. Kyles' story. You can never overcome a lack of time, unfortunately; all you can do is give it your best shot by trying not to overreach. IDA: How did your vision for the film change over the course of the pre-production, production and post-production processes? felt very heavy-handed. So after a couple of tries, I stayed away from that. IDA: As you've screened The Witness: From the Balcony of Room 306-whether on the festival circuit, or in screening rooms, or in living rooms-how have audiences reacted to the film? What has been most surprising or unexpected about their reactions? audiences. Quite a few people have come up to me to tell me that we got it right. They've said that we represented what happened just the way they remembered it. That is the best award you can receive as a filmmaker. IDA: Where were you when you first heard about your Academy Award nomination? Although it's only been two weeks since the announcement, how do you anticipate this nomination will impact your career as a filmmaker? immediate shock. I get chills just thinking about it. I feel so honored. IDA: What docs or docmakers have served as inspirations for you? AP: Errol Morris and his film The Thin Blue Line was the first time that I was really struck with the possibilities of what you can do with documentaries. Errol seems to be able to constantly up the ante with every film he makes. The Witness: From the Balcony of Room 306 will be screening Saturday, February 21 at 1:45 at the Writers Guild of America Theater in Beverly Hills, as part of DocuDay LA, and at 5:15 at the Paley Center for Media in New York City as part of DocuDay LA. For more information on DocuDay LA, click here. For more information on DocuDay NY, click here.